I believe a Body Snatcher Invader from Outer Space paid me another visit a few weeks ago. I’m positive she has dropped in on me before. I’m sure I wasn’t the one who purged my dresser drawers of outdated, unworn, and unwanted clothing. Organized and Tidy R Not Me. The Imposter decided to get rid of everything—almost. She saw a post on the web at ClassyYetTrendy.com about The Capsule Wardrobe. It involved a minimalist wardrobe with core items that could be mixed and matched to create numerous outfits. One could save both money and closet space. The Imposter was intrigued and followed up on it. The first step involved removing all clothing from one’s closet, closets in my case, and then evaluating what to keep, what to donate, and what to toss. The range of clothing sizes in those closets was huge. Unfortunately, sizes went up, not down. There was one outfit in size 8 (was I ever), a half dozen in size 10 (not so bad), a bunch in size 12 (uh-oh), several pants and jeans in sizes 14 and 16 (oh dear), and one pair of chinos in women’s size OMG! The Pod Person was appalled and overwhelmed. I believe she wept. 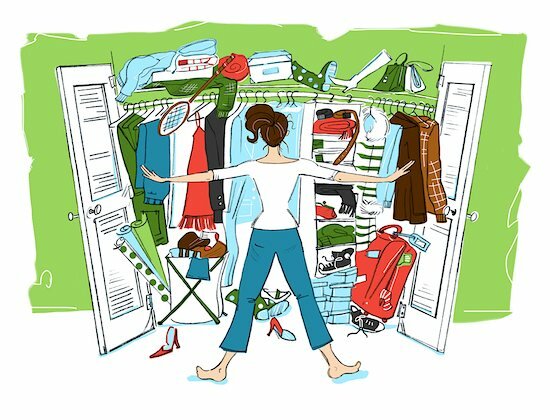 In preparation for me to pack light for an upcoming cruise, The Imposter began the monumental task of downsizing my wardrobe to capsule form. 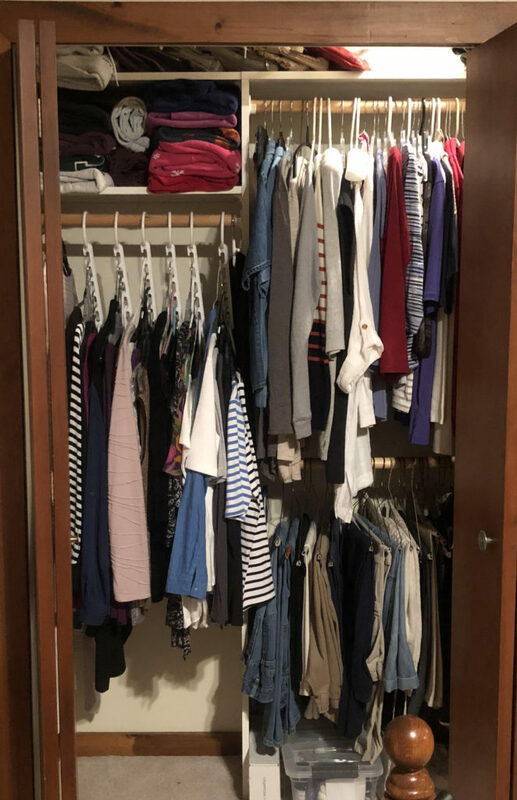 Another impetus was the impending visit of my Baby Sister, The Fashionista—and her obligatory critique of my lack of style and my overcrowded closets. The Imposter feverishly began to condemn some articles of clothing to exile. 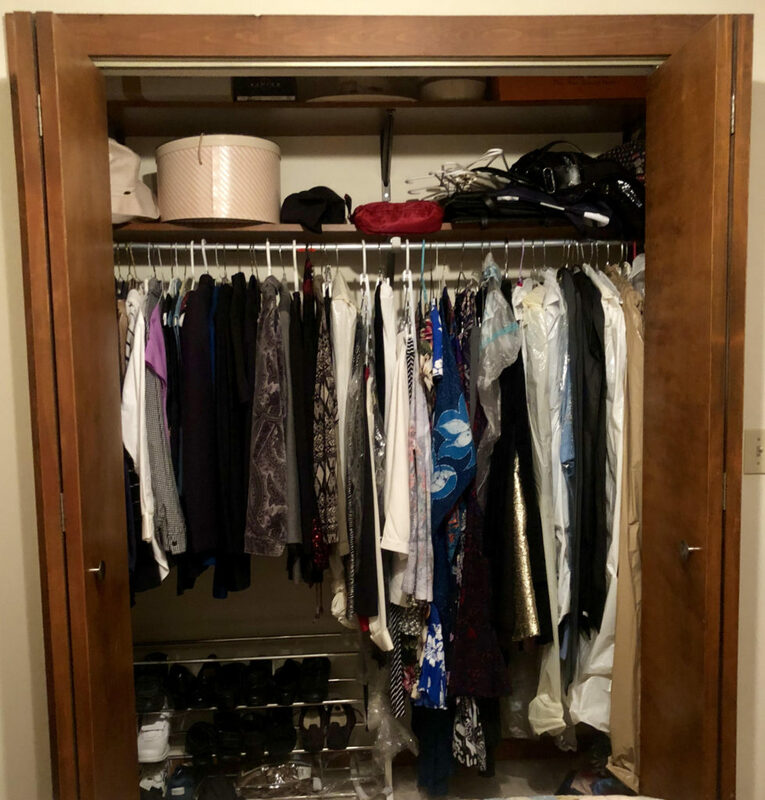 That the Pod Person Imposter somehow managed to clear some space in the guest room closet for the Fashionista by the time she arrived was remarkable. Once informed of The Imposter’s project, The Fashionista was all in. In fact, she took over. Ruthlessly, she pawed through my wardrobe, declaring item after item too small, too unfashionable, or too ugly to ever again see the light of day or even the dark of night. (She tells me constantly that my clothing choices aren’t feminine enough.) The items she found acceptable were few and far between. She spared a few long formal suits and dresses that had classic lines that don’t go out of style. That there were any outfits of which she approved surprised the hell out of both of us. She didn’t stop at divesting my closets of my wardrobe. She viciously targeted my accessories as well. She tossed out most of my hats (crimes against fashion), purses (what was I thinking when I bought them), belts that didn’t circumvent my waist (what waist), gloves (was I really in need of full length gloves that no longer fit), and then there were the two dozen pairs of shoes on the upper closet shelf (out of fashion, too small to fit now, and just plain too hideous to wear in public). As if that wasn’t traumatic enough, she attacked my stash of undergarments next. I’ll spare you the gory details. Let’s just say she rid the undergarment drawer of upper and lower foundation items that might fit a female elf but didn’t fit me. The highlight of this purge came when The Imposter tried to squeeze herself into a body suit I hadn’t worn in ages. Once partially in the suit, she became stuck. She couldn’t get it all the way on, and she couldn’t get it off either. Too much sausage and not enough casing. The Fashionista tugged as hard as she could to pull the body suit off The Imposter. They couldn’t stop laughing hysterically. Tears streamed down their faces. The Fashionista laughed so hard she had to pee. Eventually, they got The Imposter out of the body suit and it went into the toss pile. The Imposter and The Fashionista had a productive day. They tossed out more than they donated, but they were still able to take two carloads of clothing and accessories that were in very good conditions to Goodwill. 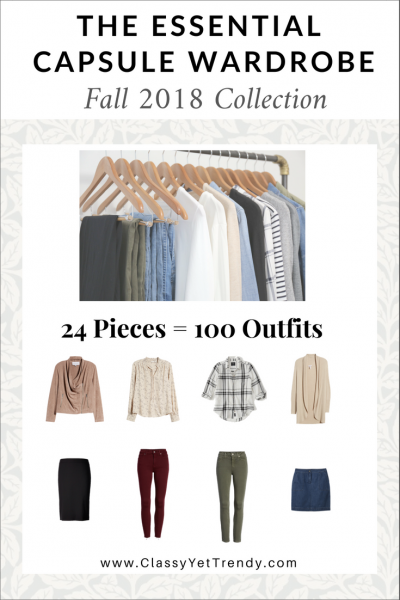 They also discovered several existing items of clothing in my closets that would work well with The Capsule Wardrobe System. The Imposter promised The Fashionista she would buy some feminine-looking items to flesh out The Capsule Wardrobe. 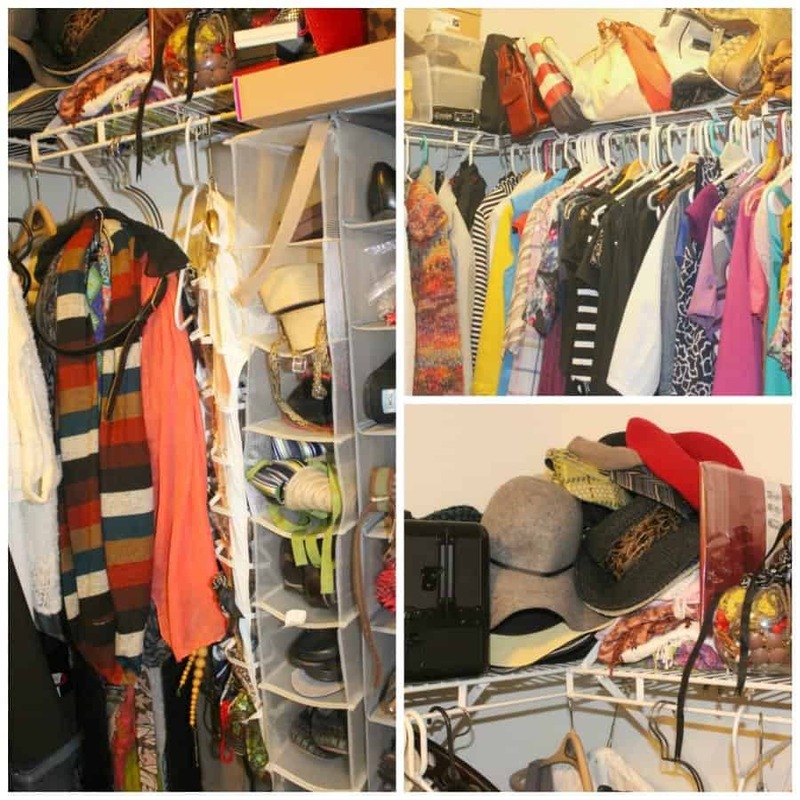 Neither The Imposter nor I thought to take “before photos” of my closets for before and after comparison. The before photos would have looked like explosions in a garment factory. The after photos are below.